After six months of waiting for the sequel to an absolutely amazing series debut, I was a little fuzzy on who was who, but that did little to dampen my excitement. 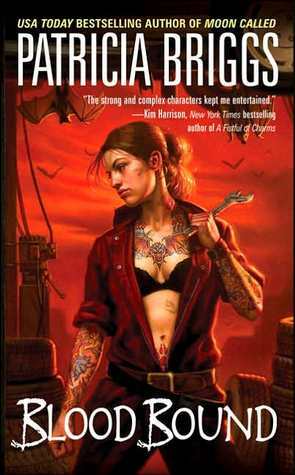 I could practically smell the awesomeness clinging to Blood Bound, and Patricia Briggs does not disappoint. I have a total girl crush on Mercy. Totally kickass and snarky, her narrative was effortlessly entertaining. She's got a core of steel but she's easy to identify with. (If you're in your late twenties, happen to change into a coyote and have the nearest Alpha claiming you as his mate.) I loved how things never go right for her but she finds a way to get through them. Especially in this installment, where she's dealing with a bunch of nasty vamps piled on top of a truckload of emotional issues like... Oh, dare I say it? Who should she be with? I was never one for love-triangles. They're irksome. Mostly because it's almost always hilariously obvious who the main character should be with, but! Romance authors, take a page from Patricia Briggs, because the lady knows how to do it right. The multiple love interests don't really develop in this book, but the story is rife with tension and possibilities. It has me salivating for Iron Kissed to see how things will develop. And then there's the plot. I don't do vampires in general, but this is a book I should not have read at night, alone, in the dark. There was a single scene where, as I read -- with only the light from my bedside lamp to chase away the shadows -- chills raced through me. Adrenaline junkies, you have found your next fix. Blood Bound is not for the faint of heart. If it's possible, keep this one to the daylight hours only. Blood Bound was a fantastic second installment in the Mercy Thompson series. I can't wait to see what happens next.